We believe the Bible is the infallible Word of God contained in the Old and New Testaments, written by the inspiration of the Holy Spirit to reveal God’s beautiful/ awesome plan for humankind. It consequently guides us in all things that pertain to life and godliness (2 Timothy.3: 10-15, John.17: 17, Psalm.119: 105). There is only one God, the triune creator of heaven and earth, who gave His only Son, Jesus Christ, to redeem the human race from sin and death, and sent us the Holy Spirit to teach us of all things, and to empower believers to fulfill God’s mandate. All three are one and the same: God, the Father, Jesus Christ, His son, and the Holy Spirit together constitute the TRINITY and are EQUALLY deserving of worship (Genesis1: 1, John.5: 26, John.1: 1-14, Matthew.28: 19, Acts13: 24). Repentance is a person’s remorse for his/her sinful ways and a genuine decision to abstain from them, and return to a relationship with God. The new birth or justification comes solely as a result of God’s grace and the blood of Jesus that was shed to pay the price of transgressions and remove the stain of sin (Acts13:39, Romans.3: 25-26, 1 Peter1: 23). Prayer is an essential part of the Christian life as it makes intimacy with God available. It helps to reveal the plans and purposes of God for His people, and it eliminates much trouble and danger that might otherwise overwhelm us. Zephaniah1: 4; Daniel 9: 13-14, Acts 6: 4, Romans 6: 4, Matthew 7: 7-11). Religiously paying tithe and generously giving offering is obligatory. It is God’s way of providing resources for operating the church (Malachi 3:8-12, Hebrews.7: 2-5). We believe in all prophecies in the Bible. Likewise we believe that we can be given the gift of prophecy by the inspiration of the Holy Spirit (1 Corinthians.14: 29). However, any prophecy contrary to the bible is rejected. 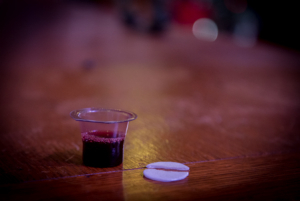 Just like Jesus instituted and commanded before his death, we gather together regularly, to share the bread and wine until He comes back again (Luke 22: 17-20). The second coming of Jesus Christ will be in physical form and will be visible to all as He was seen ascending up to heavens (Acts 1: 9-11), and the saints of God will ascend in Rapture to meet Him in the sky (1Thessalonians 4: 15-17).